Russian nesting dolls are typically painted to look like women in traditional Russian clothing. However, Russian nesting dolls can also depict Russian fairy tales, world leaders, cartoon characters, pop culture icons, sports heroes, or animals. Russian nesting dolls can be painted with particular themes like holidays or religion. Russian nesting dolls are usually brightly colored, but some can be plain, decorated with a wood burning technique, or embellished with gold paint. Russian nesting dolls can be purchased where ever Russian souvenirs are sold. Shops, markets, and street vendors are all likely places to purchase Russian nesting dolls. Russian nesting dolls can also be purchased online, either at shops specializing in Russian souvenirs or at auction sites. Izmaylovo Market in ​​Moscow is an excellent place to purchase Russian nesting dolls. Russian nesting dolls can be found in other Eastern European and East Central European countries, like Czech Republic, Poland, and Ukraine. 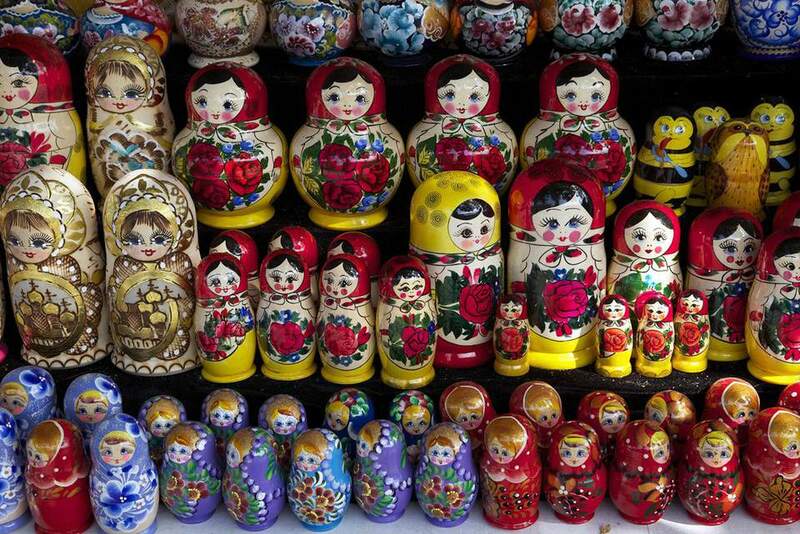 Russian nesting dolls, like many other souvenirs from Russia, are created with varying degrees of skill and care. A Russian nesting doll painted simply in a traditional style, containing three or four smaller dolls, will command the lowest prices. However, more elaborate dolls, containing 20 or more smaller dolls, are more desirable and much more expensive. Dolls purchased in large cities may cost more than dolls purchased elsewhere. Russian nesting dolls that are painted by specially skilled artists will command the highest prices. When you prepare to purchase a Russian nesting doll, consider the recipient if you are going to give the nesting doll as a gift. If you intend to give a Russian nesting doll to a child, a simply painted doll without small pieces may be better than a doll with many smaller dolls inside, the pieces of which may become lost or pose a choking hazard. Russian nesting dolls are usually painted as women, but dolls that contain a whole family – including mother, father, and children – are also available. If you want to give a Russian nesting doll as a gift, you should consider the tastes of the recipient. Humorous nesting dolls, that depict familiar historical characters or celebrities can be found in the largest markets. These dolls may have more masculine appeal. Delicately painted dolls with many smaller dolls inside make wonderful gifts for the most important people in your life. Russian nesting dolls, unless intended to be used for toys for children, should be displayed in a place that is out of reach of elbows, the wagging tails of dogs, or children. Russian nesting dolls are made of wood, and the tiniest dolls are prone to fall over, especially if the base of each doll is not level. The dolls should also be displayed away from the sunshine and occasionally dusted with a dry, soft cloth. If you are storing your Russian nesting doll, wrap the doll in something soft. Ideally, you should store the doll in a place that will not subject it to much temperature fluctuation, since the wood of the doll will swell or shrink according to the temperature and humidity it is exposed to. The small dolls inside the main doll will roll around if moved, which tends to wear on the paint, so it is best to wrap these in something soft as well. What Is the Meaning of the Word 'Matryoshka'?